This grant program gives elementary and middle school math teachers the opportunity to use a math program free for one year. The program is open to U.S. and Canadian elementary and middle school classroom educators (grades 2-8) who teach mathematics. ExploreLearning Reflex is an award-winning game-based system that enables students of all abilities to develop instant, effortless recall of math facts in all four operations. Reflex’s highly-adaptive technology provides each student with an optimized path from the initial acquisition of new facts through to full automaticity. The methods used in the system's assessment, instruction and game-based practice are based on the latest research in math fact fluency, and the system's effectiveness in rapidly developing automaticity has been validated through a large set of case studies involving thousands of students from schools across the United States. 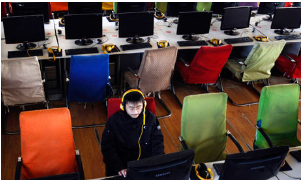 Massive open online courses (MOOCs), which have skyrocketed in popularity in the last year, offer the draw of college classes that anyone with an internet connection can take free of charge. 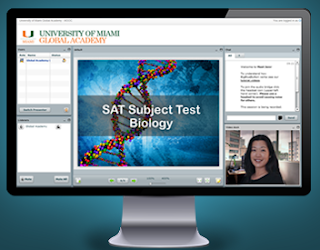 Now, the University of Miami has launched what it calls the world’s first MOOC for high school students—a three-week, six-session class that will prepare students for the SAT subject test in biology. About 200 high school students, some as far away as China, were enrolled as of press time to take UMGA’s “MOOC SAT BIO” course via Skype and an electronic classroom platform. The class will air live, allowing students to pose questions in real time—a rarity for a MOOC, according to Wilson. Meris Stansbury, Online Editor writes, "In today's news, experts say some of the most important considerations for blended learning include finding high-quality resources and ensuring network capacity." Finding high-quality resources, ensuring network capacity are key steps, experts say. As blended learning programs grow in popularity, proponents of the approach—which involves a combination of computer-based learning and face-to-face instruction—say there are a few key considerations school leaders should keep in mind as they set up blended learning models. 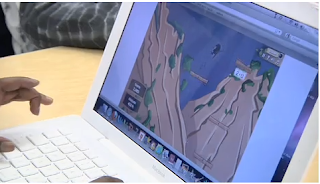 Alabama’s Mountain Brook Schools is in its third year of a blended learning program. “Education is really changing, and we’ve got to change with it—and in order to do that, we’ve really been working hard to … customize the learning of each one of our students,” said Missy Brooks, the district’s director of instruction, during a Consortium for School Networking webinar. “Blended learning is not all about the technology—it really is a blend of teachnology and instruction, so that the two work hand-in-hand so that we can meet the needs of our students,” she said. The district’s leaders bear in mind that blended learning is facilitated by an effective and intentional combination of face-to-face classroom methods and computer-based activities. Simply putting a digital device in the hands of teachers and students. Scanning worksheets and uploading them for students to print and complete. Sharing digital versions of class notes. Experiencing a mastering of technology tools. Thinking of students as being simply information consumers. Wannapa Khaopa writes, "Thailand has hundreds of international programmes, especially in the country's top performing universities, luring thousands of students from different parts of the world, particularly from the Asean region to come and study in the Kingdom." 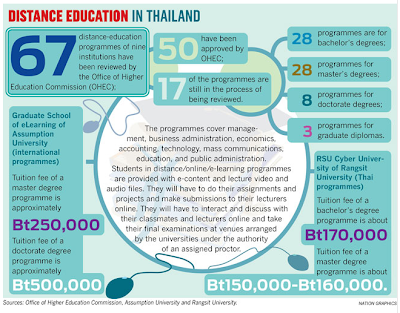 Distance education or e-learning can be an opportunity for Thailand to open up a new Asean educational market in which students can spend life at home while pursuing study at Thai universities rather than travelling here. Associate Professor Chitapa Ketavan, dean of the Graduate School of eLearning (GSeL) at Assumption University (AU) and Assistant Professor Kanda Wongwailikhit, dean of RSU Cyber University faculty at Rangsit University (RSU), also agreed that distance education would become more popular among students as it was more convenient for them to study anytime, anywhere at a lower cost. Although these educators see the growing popularity of online education, there are not many universities with international programmes in Thailand offering online or e-learning programmes. The first e-learning international programme was taught seven years ago in Thailand by AU, but other universities with international programmes have not yet offered this convenient style of education. "For the generations of children born in the 21st century, book learning has taken on a whole new meaning." summarizes Rose Simone, Record staff. Books are now apt to be tablets or smartphones, and they contain more than words and pictures. The new generation of “digital natives,” as Kunal Gupta, chief executive of Polar Mobile calls them, expects to also have fun while learning. Gupta, who was speaking at a “Mobilize” conference hosted by the Waterloo-based e-learning solutions company Desire2Learn on Monday at Bingemans conference centre, says the fact that these digital natives are practically born tethered to mobile devices is changing everything. The conference was attended by about 500 people, including educators and students interested in digital media jobs. The conference also dealt with issues such as making the learning environment equitable for students from less affluent homes and how to ensure the content on smartphones and tablets brought to school remains appropriate for younger children. The UK Guardian newspaper held an interesting debate on the hugely popular issue of MOOCs in higher education. Sponsored Q&A: How can online learning open, widen and formalise access to quality higher education? Join us on Friday 23 November from 12-2pm GMT to discuss MOOCs and more. Nancy Groves writes, "Higher education has always been fond of its acronyms and they don't get much more prolific than the current four letters doing the rounds. From the December 2011 launch of MITx Stateside to the University of Edinburgh's decision to join the Coursera platform, MOOCs (or Massive Open Online Courses) have barely been off the education news menu. Nor was the Observer alone in recently asking: "Do online courses spell the end for the traditional university?" Is online learning the answer to widening participation in higher education? Of course, the provision of off-campus higher education is not a recent development. The Open University has championed open and distance learning since 1969 – from its original correspondence courses and late-night TV broadcasts to the latest research and development conducted by its Institute of Educational Technology. By definition, online learning is the meeting of technology and pedagogy – and universities are still exploring the right balance between the two. In his 2011 slideshare, Guillermo Ramirez outlines 'five big mistakes of virtual education', from the use of the term massive ("you don't have one course of 250, you have 250 courses of one") to the risk of tech taking the fun out of the education process. Where do you sit in this debate? And what models are working best for students – and universities? In partnership with the Open University, this week's live chat will consider the new landscape of online learning and how it might open, widen and formalise access to quality higher education. Join our expert panel to talk MOOCs and more on Friday 23 November from 12-2pm GMT. 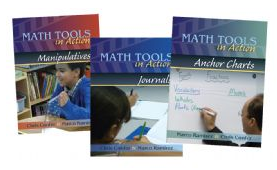 Math Tools in Action is an exciting new DVD series that shows teachers in grades 1-5 how to use anchor charts, journals, and manipulatives to deepen and improve math instruction. Each DVD chronicles a complete lesson in a real classroom, with expert commentary and teaching tips before and during the lesson. Click here to preview clips and download the viewing guides! Chris has a passion for both mathematics and teaching children. "My parents were both educators," she explains. "When I was seven years old, one of my favorite activities was playing school with my two-year-old brother Dickey, who amiably played student along with my stuffed animals and assorted toys. . . . And when I learned to love art as a high schooler, I longed to make beautiful bulletin boards, which is what I thought a teacher did. In reality, of course, teaching is very different. I love it. Marco Ramirez is an award-winning educator who has successfully transformed schools using mathematics as leverage for change. After working eighteen-hour days as a buyer and broker, Marco did some soul searching and realized that he wanted to have more time for family and a life outside of work. His wife, Julie, suggested that he work as a substitute teacher while returning to college. There’s an app for everything, but you can do a lot for free, Garfield Elementary principal Jaclyn Pfizenmaier told community members in showing them how to use iPads in a Chamber-sponsored class Monday night. The first thing someone getting an iPad should do is to set up an Apple or iTunes ID, otherwise there’s not a lot than an iPad owner can do with their iPad, Pfizenmaier said. An Apple ID enables iPad owners to buy and download songs, apps, videos, TV shows, etc., through the Apple store. An Apple ID can be set up without a credit card and there are lots of free apps and services that an iPad user can access “and not have a penny invested,” Pfizenmaier said. To demonstrate how easy it is to use an iPad, Pfizenmaier showed videos of a 100-year-old learning to send her first e-mail on an iPad and a 2-and-half-year-old watching a movie with an iPad. At times, teachers have had to let the kids take the lead and teach them how to use the iPads, Pfizenmeier said. That’s also good advice for other adults learning to use an iPad, she said. Garfield’s iPad class is held from 8:30 to 10:15 a.m. on Friday, and new iPad users are welcome to join them, Pfizenmaier said. Because the first iPad 101 class was completely full Monday, the Chamber of Commerce has scheduled a second iPad 101 Class for Monday, Dec. 10. This session is designed for people who do not own an iPad but are interested in learning more. The class will get chance to use an iPad. Only a few people have signed up for this class of 15. Session 2: iPad Family will be held Jan. 21, from 5:30 to 6:30 p.m. at the Garfield Elementary Library. This session is designed for people who own an iPad and are wanting to learn what they can do in a family environment including photos, videos, Facetime, messages, etc. Nine seats are available for this class of 20. 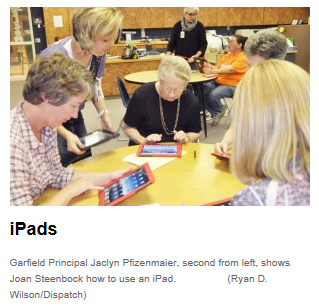 Session 3: iPad Business will be held Jan. 21, from 5:30 to 6:30 p.m. at the Garfield Elementary Library. This session is designed for business owners/managers who own an iPad and want to learn what they can do to enhance their business including, forms, organization, QR Codes, Facetime, and much more. Thirteen seats are available for this class of 20. 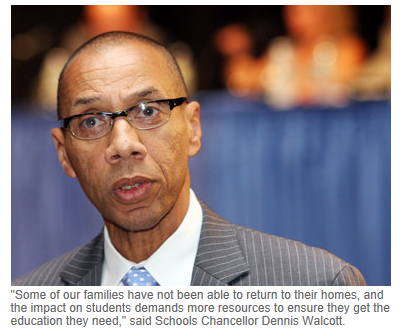 Intermediate and high school students who have been displaced from their homes or their schools by Hurricane Sandy can take online classes to help keep up with their classwork, city schools Chancellor Dennis Walcott announced Tuesday. The online courses will be available for students in grade six through 12, in core subject areas and electives including English, math, economics, calculus, world history and Spanish. Teachers who have experience in online learning will teach the courses, and the New York, Queens and Brooklyn Public Library branches will provide enrolled students with internet access at locations throughout the city -- including on Staten Island. Any students in the borough who don't have internet access at home -- or who cannot go home in the wake of the hurricane -- can take the courses using computers at any Staten Island branch of the New York Public Library. To enroll in these online courses, students must call 718-642-5885 to fill out an interest form, or they can do so online at www.ilearnnyc.net/virtuallearning2012. Staff will then follow to determine if students are eligible, and will set up learning plans. Jon Bruner reports, "The American college system is staggeringly large: 2,421 four-year institutions enroll about 18.5 million college students. The proportion of Americans with a bachelor’s degree is at an all-time high — a social victory if they’re able to enjoy a positive return on their degrees, which the Pew Research Center estimates at about $550,000 on average." TAMAR LEWIN writes, "Teaching Introduction to Sociology is almost second nature to Princeton professor Mitchell Duneier: He has taught it 30 times, and a textbook he co-wrote is in its eighth edition." But last summer, as he transformed the class into a free online course, he had to grapple with some brand-new questions: Where should he focus his gaze while a camera recorded the lectures? 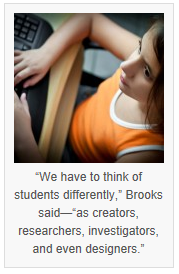 How could the 40,000 students who enrolled online share their ideas? And how would he know what they were learning? 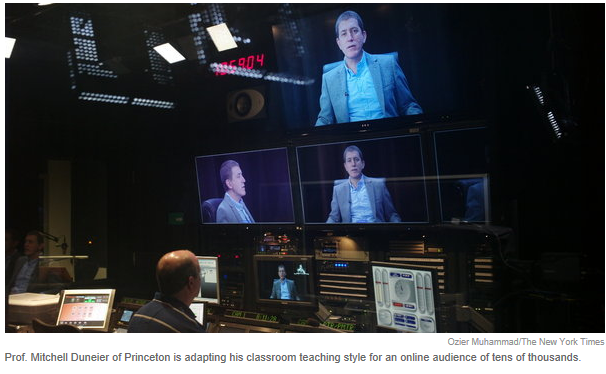 To create a Princeton seminar's feel, Mr. Duneier used a video chat room in which six or eight students -- Dipendra was one, others were from Siberia or Iran as well as Princeton -- discussed the readings; students over the course of the week could replay the video and comment. As with other MOOCs, less than 5 percent of those who enrolled in the sociology course finished it: 2,200 midterm exams and 1,283 final exams were submitted. Some students listened to all the lectures and did all the readings but didn't take exams. There was no reason to do so since Princeton -- unlike Udacity, edX or other universities working with Coursera -- does not give certificates of completion. "The classroom as we know it is dead. It is outdated in helping children meet their full educational potential." 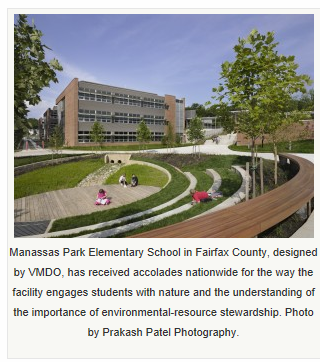 summarizes Robert W. Moje, AIA, LEED AP Principal, VMDO. Based on a factory-inspired model, the American classroom was designed to help children receive an adequate, standardized education. The prototypical public school classroom is set up to run 20 to 30students through the same educational obstacle course, at the same pace, with the same intellectual nourishment. The desire is that a certain majority of the class will finish with “passing” results that will help ensure further support and funding for the school. This system is predicated on a percentage-based hope that a child will fall within a certain range of measured intelligence. But what happens to those students who don’t “pass” or to those who finish with better-than-average results? The classroom model has failed to provide both inclusive and individualized educational experiences for American students, particularly for those at the extremes. The challenge before us is to educate each child and unlock every student’s individual potential as citizens and future leaders.